Lemax French Pastry Shop Lighted Facade depicts an illuminated traditional French street shop window displaying delicious festive cakes in viewable three dimensional shop window displays. 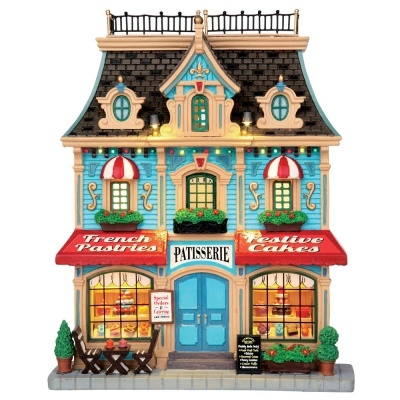 Lemax French Pastry Shop from the themed Essex Street collection is a flat-backed slim lighted building suitably placed in and amongst a seasonal Lemax village street scene. A popular Lemax Caddington Village collectable table piece that joined the Lemax collection in 2015. Facade includes dual switches on the right hand side, one controls the main internal lighting whilst the other controls external lights which twinkle on and off alternately along the cornices. French Pastry Shop offers a delightful self standing building on an individual base to compliment your seasonal Lemax Christmas Village.